To promote biofuel production, the U.S. government is becoming both the investor and the customer. The White House announced on Tuesday a $510 million investment to speed up biofuel production for the military and beyond. The money will come from the U.S. Departments of Agriculture and Energy, as well as the U.S. Navy, and it will go to biofuel producers over the next three years that promise to pony up at least the same funding amount to build commercial plants. The project came as a response to a plan laid out by President Obama in March of this year to reduce the country’s reliance on imported oil. Agriculture Secretary Tom Vilsack said the initiative is unusual because it brings together three agencies to tackle three thorny obstacles that have prevented the mass production of biofuel. The agriculture department will work on securing feedstocks while the energy department will look for the right technologies. The Navy, which as a huge fleet of ships and planes, will be the customer. The Navy aims to replace half of the fossil fuel-derived energy with domestic fuels, said the Navy Secretary Ray Mabus. That goal will require 8 million barrels of biofuel per year by 2020, he added. Fuel produced from the initiative also will be used by the private sector. But the government is emphasizing the needs of the military to have a strong source of domestic fuels. Details of how the money will be doled out and who are the likely beneficiaries haven’t been worked out. The three secretaries said they want to distribute the money evenly across the country to help create jobs in rural areas and provide a new source of income for farmers and ranchers. The secretaries also said they are looking for technologies that will turn non-food feedstocks into drop-in replacement for existing fuels for jets and diesel fuels. Drop-in replacement fuels by definition should easily blend with or completely replace fossil fuels, and ideally they wouldn’t require any special infrastructures for its delivery from the refineries to customers. 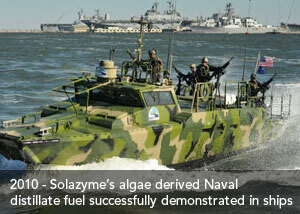 There already are companies working on fossil fuel replacement technologies, such as Gevo(s gevo), KiOR (s kior) and Solazyme(szym), which has produced fuels from algae for field tests by the Navy. Both the agriculture and energy departments have given many loans and loan guarantees to biofuel producers in the past two years. Biofuel producers have relied on government for financial support because they aren’t able to secure private money, or do so cheaply, for their first commercial plant. Although the federal government has mandates to gradually increase the amount of biofuel in the nation’s supply, whether the money is well spent remains to be seen. Many of the recipients are working on setting up the plant. Biofuel production and sales haven’t jumped substantially in the country partly because producers are finding it difficult to nail down their processes of converting biomass into fuels. Another issue has been finding investors willing to finance refineries.